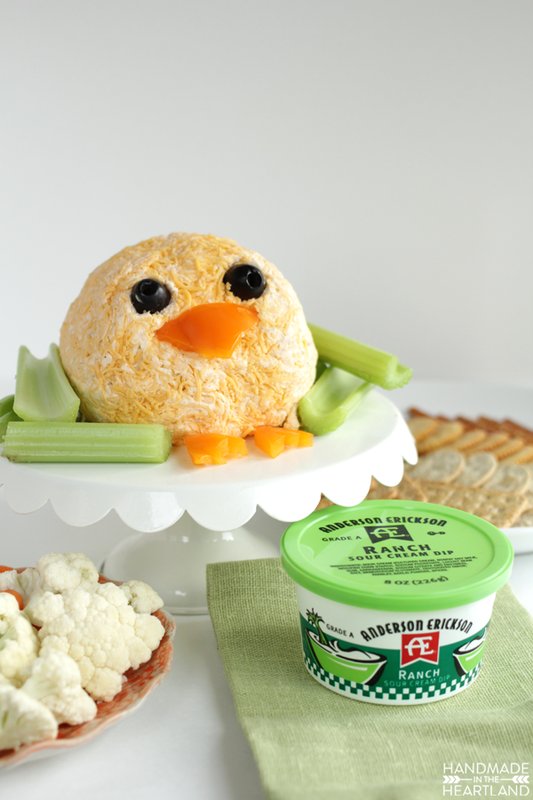 Easter is right around the corner and todays Easter Chick Cheeseball is clearly the cutest thing you’ll make this spring. The cheeseball is a buffalo bacon ranch recipe with a special ingredient from my friends at AE Dairy that takes it over the top delicious, trust me this chick won’t last long once the crackers come out! The super simple “decorations” will take you no time at all making this appetizer a must make recipe for Easter brunch or dinner! 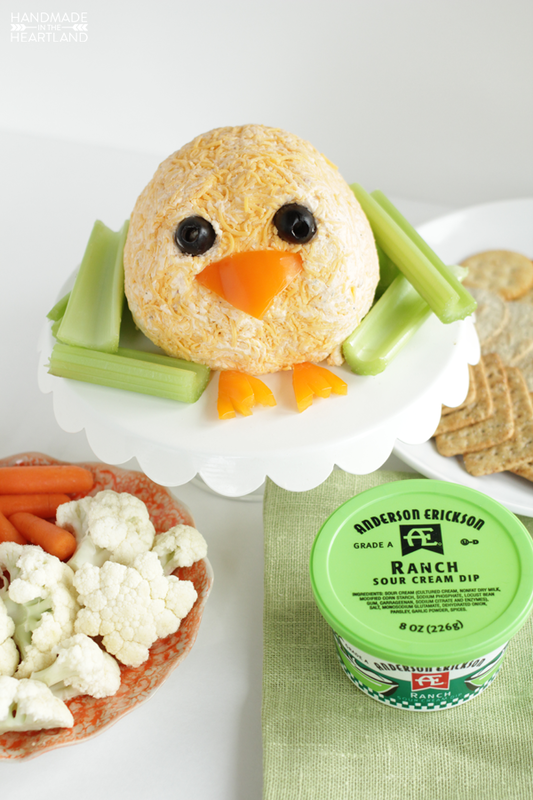 I’m a huge fan of the AE Sour Cream Dips, I’ve talked about them before– especially the French Onion flavor, and for this recipe the Ranch Sour Cream dip was the perfect addition for this cheeseball. This cheeseball is a little softer, which is nice for dipping and the flavors meld together perfectly. 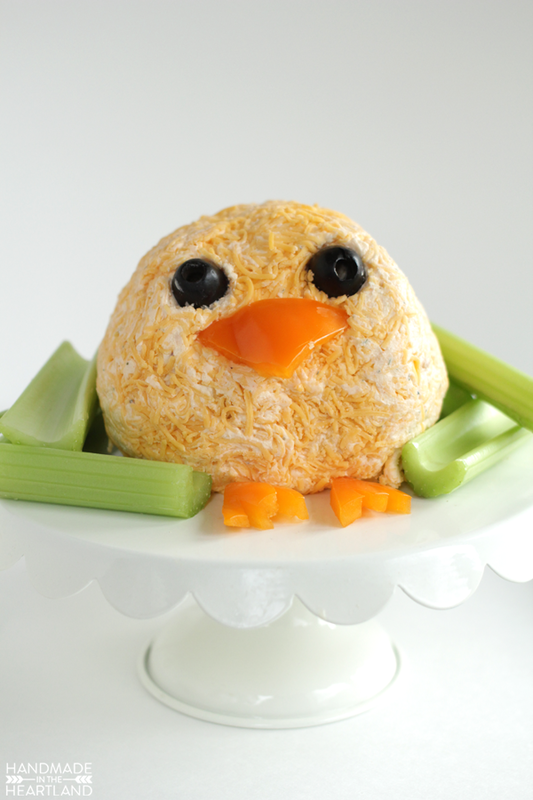 To make the chick have its yellow exterior just roll the ball in finely shredded cheddar cheese once it’s all mixed up! 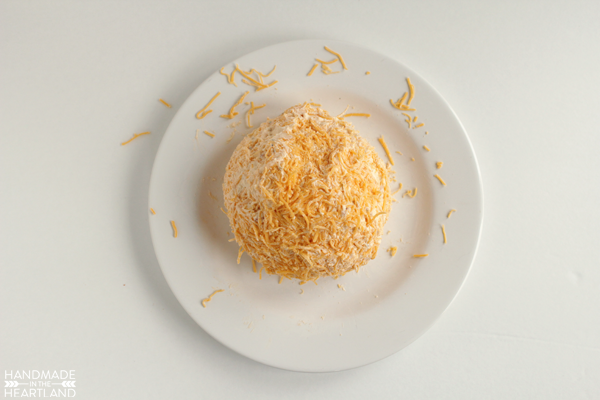 I’ve learned the trick to shaping a cheeseball is to do it with wet hands. After rolling it in the cheese wrap it in plastic wrap and put it in the fridge to firm up before you add the decorations and serve it. I’m such a fan of how fast cheeseballs come together. When I’m headed to a party its nice to bring along an appetizer and this comes together in 10 minutes or less (if I have the bacon already cooked and the cream cheese already at room temp) or if I am actually throwing the party I never have time to make individual appetizers on top of my menu so a cheeseball is the perfect solution! 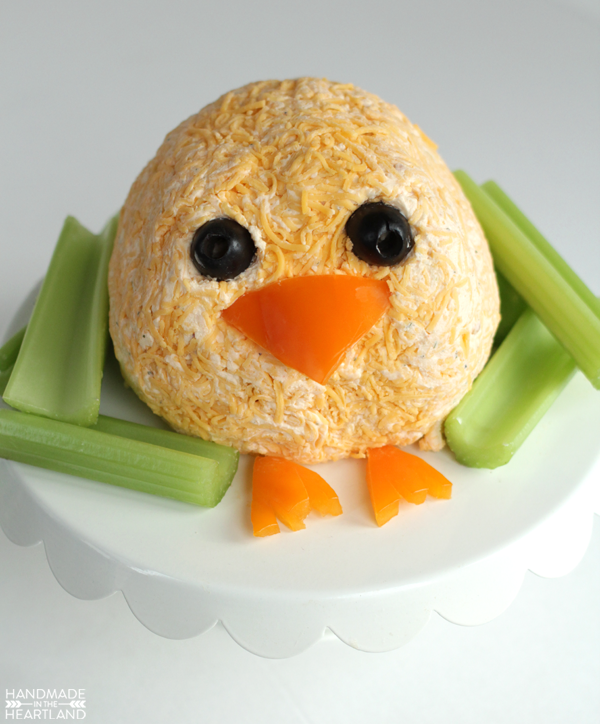 And seriously how cute do a few simple facial features make this Easter chick?! To make your cheeseball make sure your cream cheese is at room temperature, I like to take mine out 2 hours prior to making the recipe. 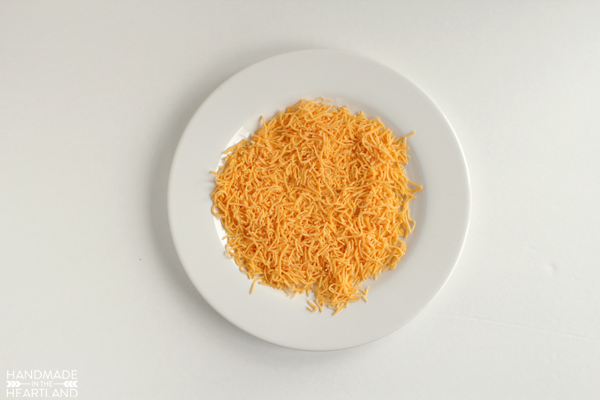 In the bowl of a stand mixer add all the ingredients, except the cheddar cheese and mix with the paddle attachment until well combined. With wet hands grab the entire mixture and form into a ball. 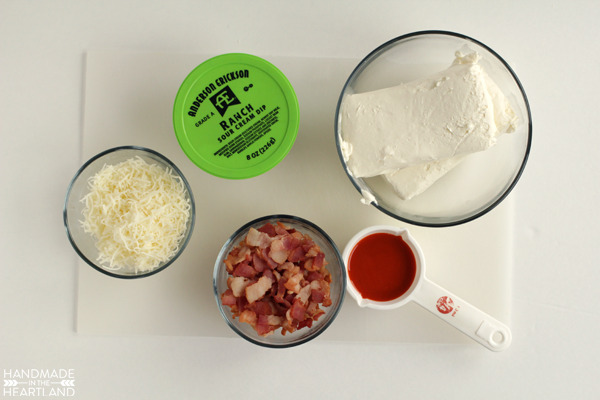 Roll the ball in the cheddar cheese to coat the entire ball. Place on plastic wrap and then wrap up and put in the fridge. 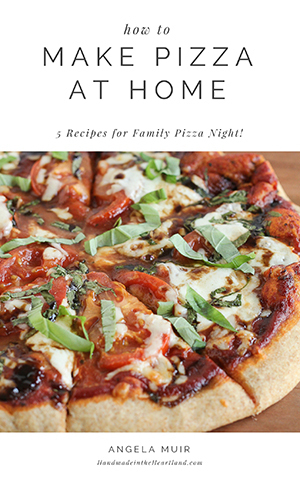 Place in the fridge for at least 2 hours to firm up before decorating. 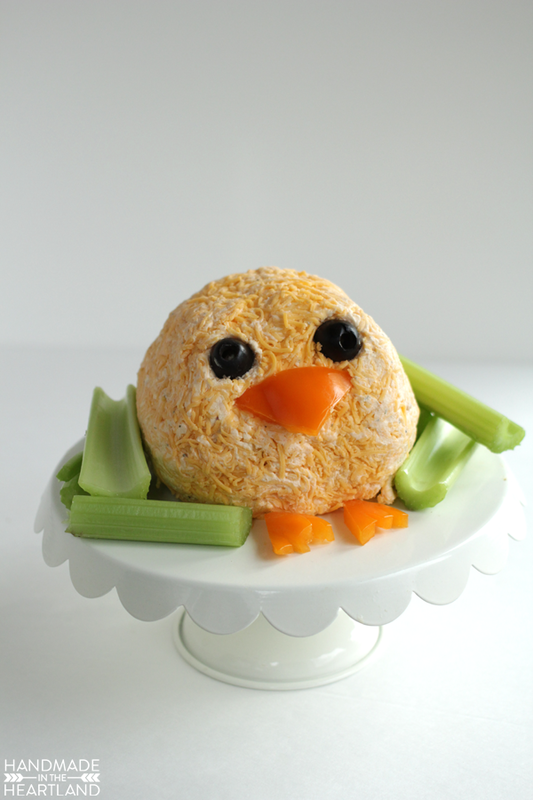 To decorate as a chick I used 1 orange bell pepper and 2 black olives. I used a spoon to carve out little indentions in the cheeseball for the eyes, and then placed the olives in the little holes I carved out. I cut little triangles for the feet and a large wide triangle for the beak. The beak will stay if you just firmly press it into the cheeseball.